Responding to news that the mayor of London, Boris Johnson, has today overruled the London Fire and Emergency Planning Authority and ordered planned frontline fire service cuts to go ahead, Ian Leahair, Fire Brigades Union executive member for London, said: “The cuts are dangerous and wrong, and this is devastating news for Londoners, with lives across the capital being put at risk by the mayor’s reckless cuts. “Johnson has simply ignored the evidence, and his cuts will mean slower response times for four million Londoners. “It’s also an affront to democracy: Johnson has not listened to Londoners, his own fire authority or the elected representatives on the London Assembly. The plan will see 10 stations closed, 14 engines removed, 552 frontline jobs slashed and the removal of two rescue units. 94% of Londoners who took part in the public consultation opposed frontline cuts in the London Fire Brigade, and hundreds of Londoners also voiced their opposition at public meetings. The London Assembly and several local authorities also oppose the cuts. 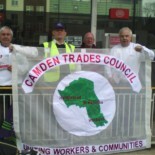 This entry was posted on August 6, 2013 by CAMDEN TRADES COUNCIL.